There are a few things uniquely Austrian – Arnold Schwarznegger, wiener schnitzel, and apple strudel. Impressive as those things are, they are nowhere near as unique as Meinklang. In a world where wines are often crafted for the lowest common denominator of consumers, they’re as unique as the mathematical constant Pi. And they take pride in that. 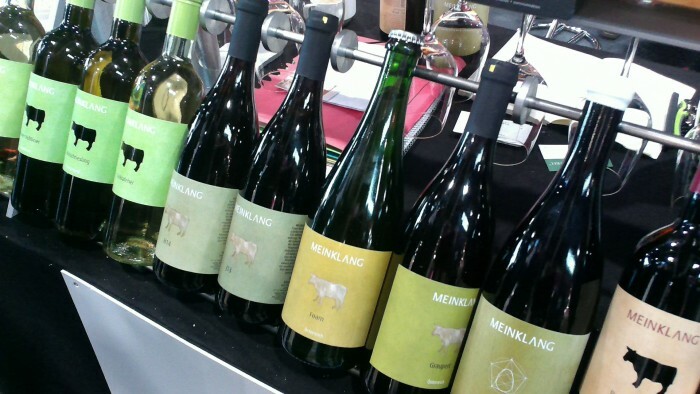 Tasting through an exciting lineup of Meinklang wines at Prowein in Germany. 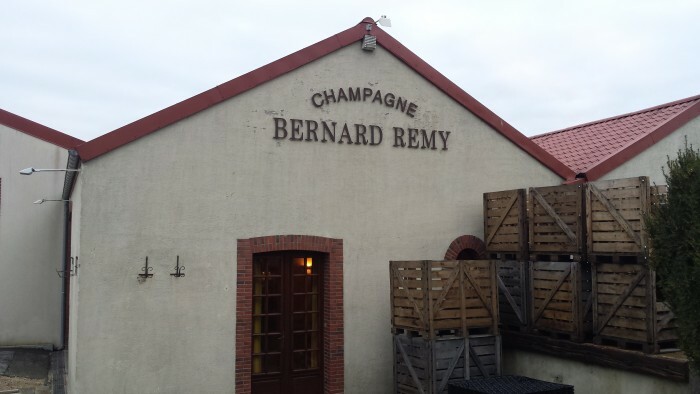 To begin to understand this unique winery it’s best to start with their name. Meinklang is made from two words “mein” which means “my” and represents the personal signature of the young winemaker couple Werner Michlits and his wife Angela and “klang” which means “sound” and symbolizes their harmony with nature. Angela and Werner Michlits are at the center of this family owned, biodynamic, organic run winery (center and center-right in the picture). The Meinklang farm is a true biodynamic utopia. True to the idea of a “wine garden”, their land is a stage where the circle of life is on full display; all sorts of fruits, vegetables, even weeds thrive here, and birds, mice, and even mosquitoes have their place. Hell, they even have “insect hotels” stationed around the vineyards. All this serves to promote biodiversity, from the birds that feed on insects and fruit, to the yeasts that develop on the plants. 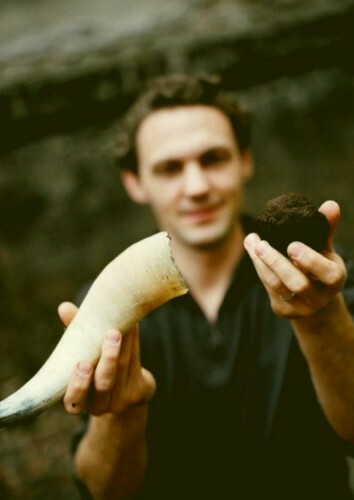 Werner shows off a ball of fermented cow dung, a biodynamic staple that will be used to fertilize the vineyard. 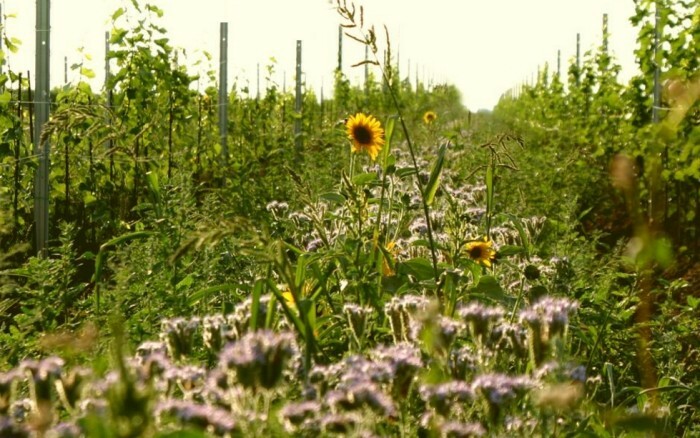 While some growers prefer tightly manicured rows, the Michlits look fondly upon the hundreds of species of weeds, clovers, wildflowers, and other plants growing between the vines. They pay careful attention to the land, rotating crops and treating the soil with biodynamic fertilizers and soil conditioners made from plants, quartz powder, and their own herd of 300+ livestock. 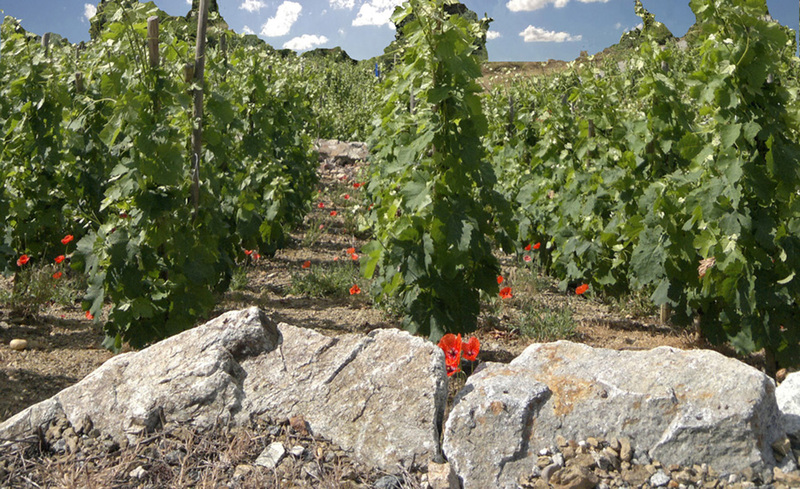 The result is a living soil brimming with microbes that breathes character and life into the vines. A diverse cover crop sprouts up between the vines, loosening the soil and encouraging the vines to fight for their share of nutrients. When we met them at ProWein recently, they took pride in telling us about their untamed and untrained Grauburgunder vines (probably the kind of thing Andy Beckstoffer has nightmares about). This vineyard grows wild, with no pruning to stress to the plant, and the vines produce smaller berries with a higher skin to pulp ratio they claim brings more flavor and complexity to the wine they call “Graupert” – German for “uncombed hair”. 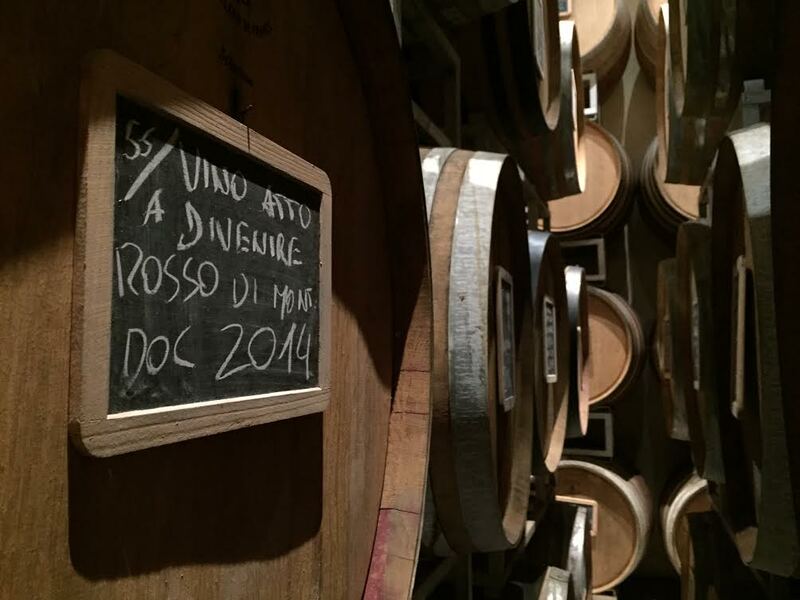 Some producers take a strict scientific approach to winemaking, manipulating each vintage to fit an expected mold. Meinklang is not one of those wineries. You’ll never see any reverse osmosis to increase concentration, oak chips to mask flavor, or chaptalization to increase alcohol and sweetness. Handmade concrete eggs help their production by providing a perfect amount of micro-oxidation, enhancing their wine’s aromas and flavor. Instead they let the grapes and the land dictate the final product, and do as little as possible when it comes to winemaking. 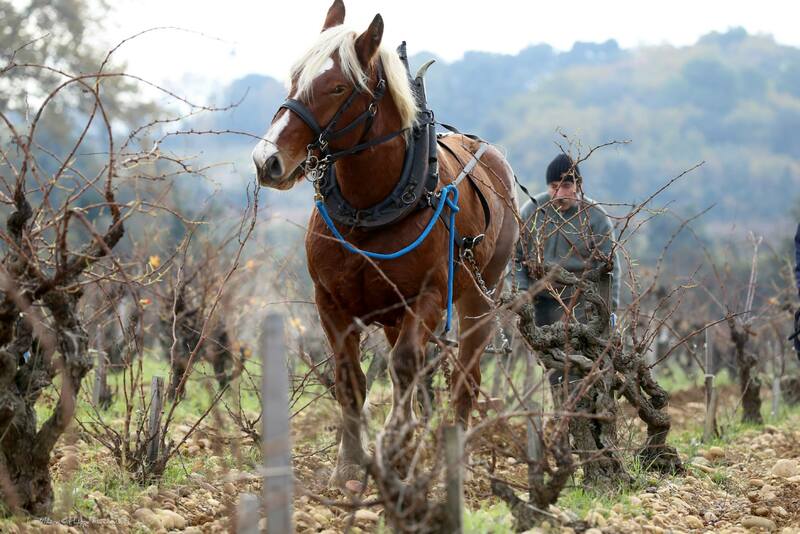 Their holistic approach starts in the vineyard, where they use organic and biodynamic farming practices, and extends into the cellar where they rely on native yeasts for spontaneous fermentation and gravity for moving grape juice. 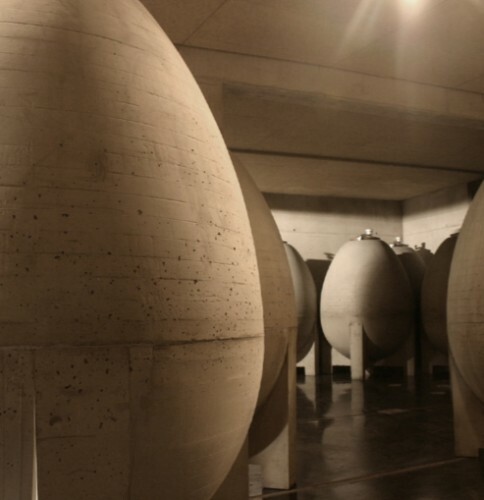 They even crafted 100 homemade concrete containers shaped like eggs which they use to age the wine. Sulphites, while legally required in the EU and United States, are kept to an absolute minimum. As for the wines, their lineup reads like a two disc “Greatest Hits” album. 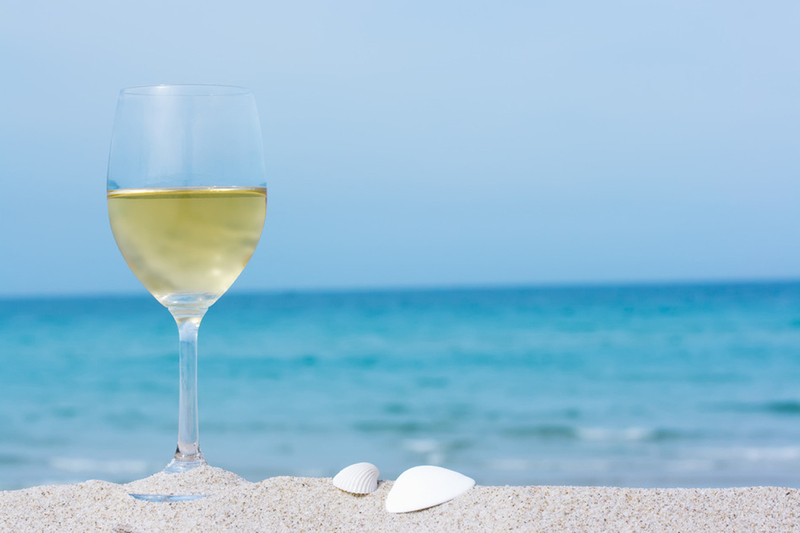 They make more than two dozen labels, including Zweigelt, Blaufränkisch, Merlot, Grüner Veltliner, St. Laurent, Pinot Blanc, Pinot Noir, and Pinot Gris with names that are fun to say, like “Foam” and “Graupert”. Each wine shows a purity and freshness of fruit – imagine Freddy Mercury vocals and Muddy Waters honest grit fused together – soulful wines that are honest and enjoyable to drink. They even microbrew beer and make a naturally sparkling “frizzante” that’s unlike anything we’ve tried. 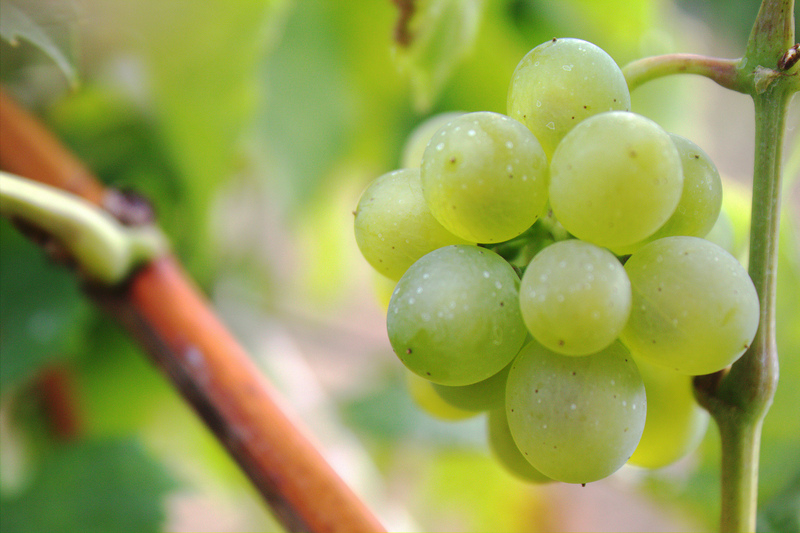 The Gruner all about feshness, with vivid acidity, citrus and crisp pear, mineral, and crunchy apples flavors, plus that distinct tingly acidity that Gruners have. Their Zwiegelt is fruity as all get out but complex and layered!! Crushed flowers, cinnamon, mineral, dark cherries….just the COOLEST thing we’ve had in some time. 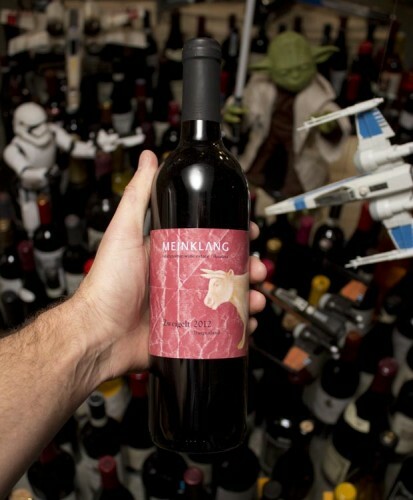 Meinklang has to be one of the hippest and most exciting producers we import, and you’ll have a hard time finding a winery more in tune with their surroundings and dedicated to a natural philosophy of winemaking. Chances are you haven’t drank too many Austrian wines, and sure we could sit here and capitulate endlessly about how tasty their wines are, but the best thing is to experience one yourself. Next time you see their conspicuous label on our website or on a store shelf we implore you to jump at the chance to score some – you won’t regret it.